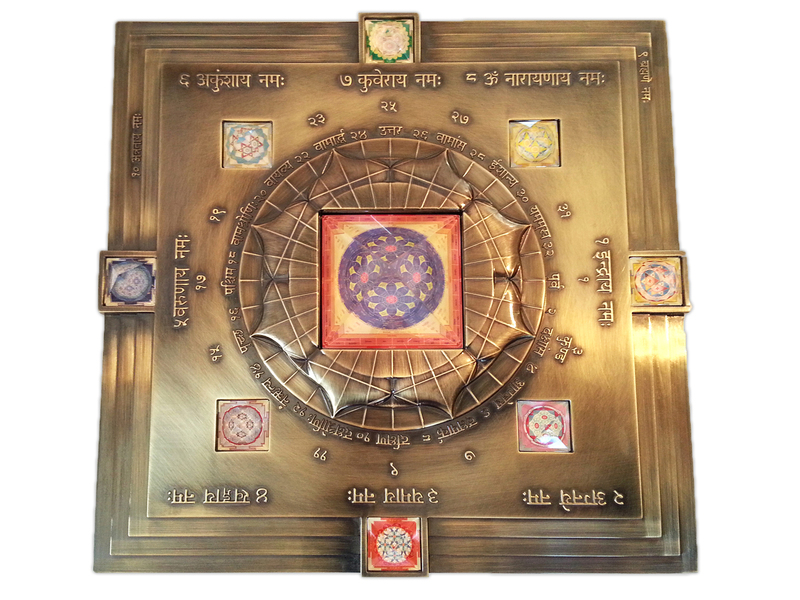 Meru Chakra (the 3-dimensional Shri Yantra) is the most important corrective tool of Vastu and can be effectively used for correcting defects of the north (direction of health, fortune and money) and northeast (energetically most important and most valuable area of the house). The elaborate precious metal casting (silver, antimony, copper, zinc, pewter) is covered with 24 carat gold. Precious material and the highest precision in manufacture make the original Meru Chakra unequalled in its aesthetics and its energetic effect. The Meru Chakra has been examined according to LIFE TEST® criteria with the aid of meridian energy measurement (with “Prognos”) in a double blind test and has been rated as “energetically very good” in total judgement. The Vasati pyramid is best installed in the centre of a house or room or on another energetic key point. This powerful pyramid can correct Vastu defects to a high degree without any analysis. The Vasati pyramid’s powerful corrective effects are due to the synergic combination of all the important vasati correction tools: 12 yantras, 9 glass pyramids, mantras, Vastupurusha mandala and the installation ceremony. The Vasati pyramid equalises up to 75% of negative spatial energies and Vastu defects with an effect range of around 22 metres. The counterbalancing effect of a combined usage of correctly placed yantras with a Vastu pyramid and/or Meru Chakra can be as much as 98%. The Vasati pyramid when can therefore neutralise nearly all of a building’s negative energies without having to probe into the specific nature of the defects. 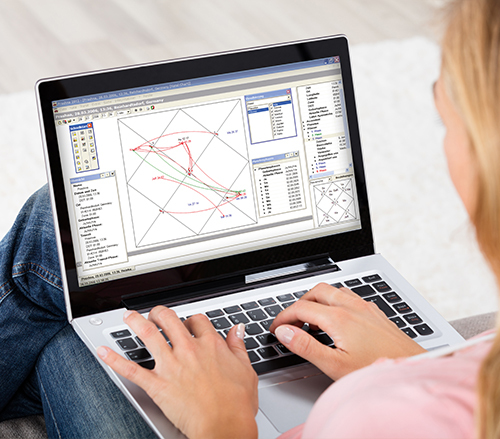 This innovative software for Vedic Astrology integrates all the essential functions needed for everyday work with the Vedic Astrology. Because Prashna® is based on the unbeatably clear and effective Systems Approach to Astrology as thought by Prof. V.K. Choudry, it can fulfil functions which no software in the world can accomplish. The successive version of the three build-up editions of the software always includes the preceding version(s). In the following we present some of the features. This software only works with Windows operating systems – Windows XP or higher! You can click on each element (planets, signs and houses) with the mouse and obtain helpful information about its qualities and significations. Interpretations of the planetary positions are also shown. Aspects and conjunctions are visually displayed using colourful arrows. This is one of the reasons why this software is ideal for studying Vedic Astrology. 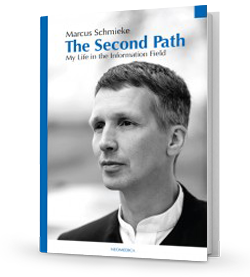 Moreover, the Basic Edition includes a comfortable transits function and the function for the analysis of the transits and the birth chart. It also features informative diagrams for planetary strengths, the strength of the houses, planetary phases, harmonic subcharts etc. The Interpretation Edition of Prashna provides you with ca. 14 pages of detailed text interpreting and analysing the given chart. This document also gives an interpretation of about the determined Ayurvedic constitution and additionally supplies a Vastu horoscope for better living quality. In the Interpretation Edition you will find elaborate individual recommendation how you can transform the weak spots in your natal horoscope with mantras, yantras, colours, gems and deeds. This unique function enables you to determine the possible events for any given time period. It considers the natal chart, the planetary phase and the respective transits. You set the time period and some search criteria. The Muhurta Search Function automatically calculates the auspicious moments that meet your criteria. 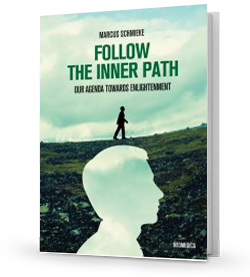 This function enables you to ensure more power for all starting points and initiatives in your life. With the Transit Search Function you can automatically find those days in your life when your planets are have a specially good or bad placement. The Transit Calendars shows the course of your planetary strengths and strengths of the houses over a desired period. It represents so to say your karmic biorhythm. Extensive atlas with latitude and longitude for places around the world and automatic determination of the summer time for these places. The energies of space can be directed by geometric symbols placed at certain places of the room. 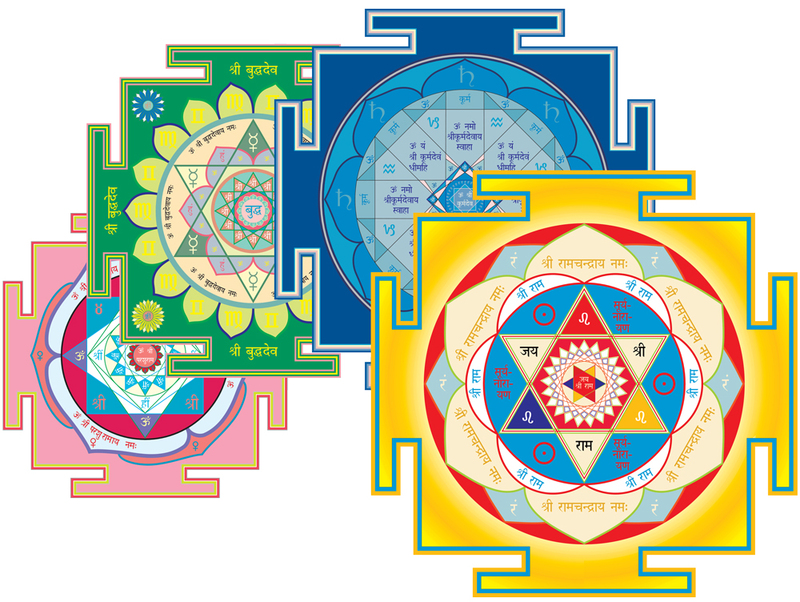 Such graphic tools are called yantras in Sanskrit. They are used as tools for the expansion of consciousness by serving as an object for meditation. However, they always entail an energetic component. In order to make them work most effectively on the energies of a room, it is necessary to place them at a suitable location. Healy allows you to analyse which exact, individual frequencies you need at this moment, and then apply them. Our desire is that your wellbeing is improved and your life is supported in a holistic and sustainable way. Use the Healy for various illnesses, mental strength, sports, wellness and recreation. We want everyone to have the opportunity to live in a holistic, healthy way. The Healy is a certified medical device and is the first smartphone controlled wearable that can deal with a variety of diseases. It aims to simply give you the frequencies you need, right now – whether at home, on the road, during leisure or at work.